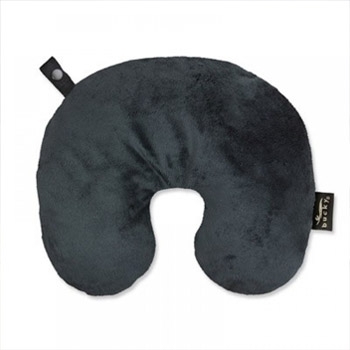 Your Fun Fur Charcoal Neck Pillow will conform to your neck and head providing exceptional support and comfort. Bucky makes uniquely luxurious products to help you sleep, relax, relieve your body's aches and pains and travel more comfortably. Give yourself the gift of deep relaxation with Bucky's Travel Neck Pillow. This neck pillow is a blissful combination of silky-smooth millet hull filling and luxuriously soft fur fabric that provides optimal neck support and restful sleep anywhere life takes you. With the convenient Snap & Go feature, attach the Travel Neck Pillow to your luggage or purse in seconds. 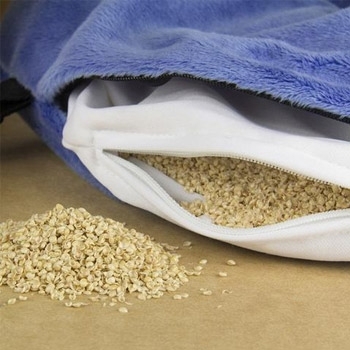 The eco-friendly millet hull stuffing is the secret to extreme comfort: it conforms to your head and neck to provide firm, yet soft support that relieves muscular tension and allows you to fully relax. Even better, all Bucky millet filling is triple-cleaned, hypoallergenic, and grown without the use of pesticides, fertilizers, or additives. Easily customize the Travel Neck Pillow to your comfort—simply unzip the concealed zipper and inner liner to add or remove filling. Enjoy luxurious comfort while traveling, reading, watching TV, napping, and more. 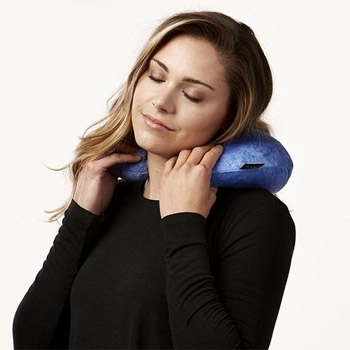 Every Travel Neck Pillow comes with a removable, washable cover. DO NOT MICROWAVE. Use it at home or on the go! Coordinate with the Bucky Charcoal Sleep Mask with Ear Plugs!